11 x 9 ½ in. Peter Paul Rubens, the son of a prominent Flemish family, was initially destined to become a courtier. He persuaded his mother to let him devote himself to painting. He left for Italy in 1600 and remained there for eight years until his mother's illness forced him to return to Antwerp. 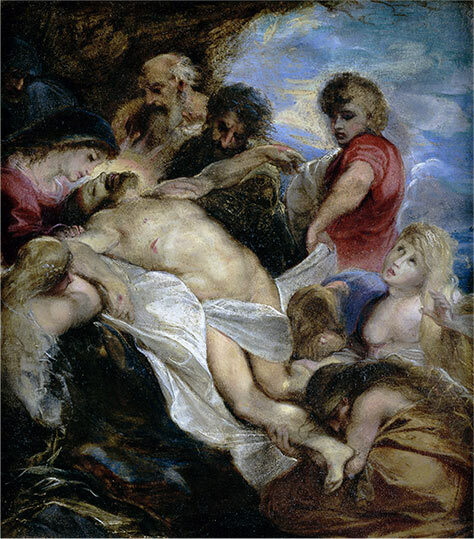 Rubens' study of ancient art and Italian painting profoundly influenced his artistic style. He established a studio, received significant commissions, and taught many pupils. After the death of his first wife in 1626, Rubens entered the diplomatic service and made several trips to England and Spain. He was a man of such wide-ranging intellectual learning and talents that some of his contemporaries considered his artistic gifts to be among the least of his talents. He was fluent in Latin, French, German, Italian, Dutch, and Spanish. Rubens was also a gifted diplomat and was widely read in classical literature, Christian thought, and contemporary affairs. This painting depicts the scene after Christ's descent from the cross and before his entombment. The Virgin Mary leans over the body of Christ while Mary Magdalene kneels at his feet. Joseph of Arimathea, Nicodemus, and lamenting women complete the circle of mourners. The back of the painting bears the seal of the noble Colonna family of Rome. The work is listed in the 1783 inventory of art treasures in the Colonna palace outside Rome. From 1605 through 1606, Rubens's brother Philip was secretary and librarian to Cardinal Ascanio Colonna (1559 – 1608), and it is likely that the Cardinal commissioned this picture. It was later given to the painter Giuseppe Cades (1750 – 1799), whose signed declaration of ownership remains on the back.